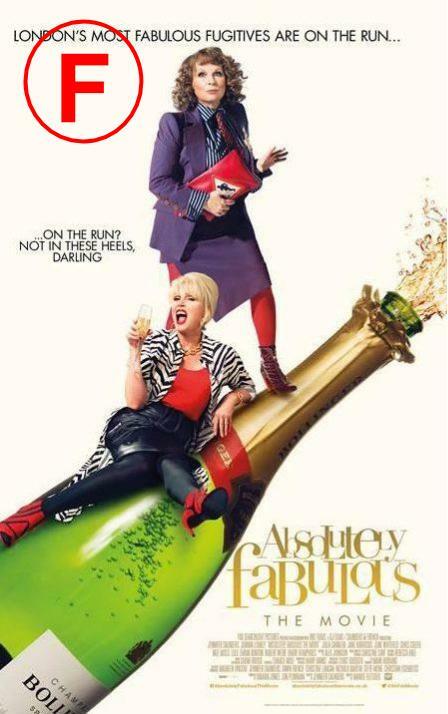 'Absoluely Fabulous' has been a well recieved British comedy with spells in the last three decades. I would never have thought that this would be so succesful based on this movie. Yep, this movie certainly isn't where you should start if you want to get into this series. London publicist Edina Monsoon (Jennnifer Saunders) and best friend Patsy (Joanna Lumley) are forced to leave London to the French Riveria due to being accused of possibly murdering supermodel Kate Moss. Now from the plot synopsis alone, it is incredibly stupid and that is clear throughout the movie. For one, if you are a suspect in a possible murder, I'm sure the police would be a lot stricter to you. Also, paparazzi are completely surrounding Edina's home and take photos of anyone who enters or leaves the home. Apart from one time. When both Edina and Patsy put on big hats and glasses- not suspicious at all- and get away safely without any questions. The story is terrible and doesn't make sense to how they'd get this far at all. The film is also meant to be a comedy which for me didn't really work at all. The jokes are awful and fail to land on the most part. As a TV show that has been aired for so long, I expected a lot more and it just failed miserably. The funniest parts of the movie come from when the characters have short bursts of cynical remarks. Unfortunately there just isn't quite enough of this to carry a full length movie and it doesn't get help elsewhere for comic relief. As a newbie to this series, it is probably unfair to start off at the movie. However, I have absolutely no intention of looking at any other 'Absolutely Fabulous' content and that is mainly down to the characters. Nobody in this film is likeable in the slightest. They are awful people who don't have many redeeming qualities or are funny enough to make up for it. Some were just horrible, insufferable people. Some were just plain weird and weren't even funny. I'm guessing I'm in the minority with this as it appears to have been a succesful show for many years which I'm hoping was much better than this movie. You can clearly see that this is a British movie and I can't really see it transcending well anywhere else. The film is filled with cameos of British "celebrities" that even I was like "who even is that?" at times. The cameos aren't great and don't add much to the film and it tries to rely on that for entertainment far too many times. You can get away with this sometimes but it helps if the cameos are people who you're very happy to see which doesn't happen very often in the movie. 'Absolutely Fabulous' was possibly the hardest movie to get through this year and it was topped off with a completely terrible ending. The movie tries to insert an emotional ending that was so out of place and did not work at all. Then the revelation at the end made the entire film so pointless and only confirmed that this was most definitely a huge waste of my time. 'Absolutely Fabulous' was absolutely dreadful. So have you seen 'Absolutley Fabulous'? If so, what did you think of it? If you do choose to see it, I hope that you enjoy it more than I did. Once again, thank you for taking the time to read my review, it is much appreciated!